Psytrance and Goa like it should be beams you right into a dream of sound and light. Goa... *sigh* that's not only a place, it's a state of mind. 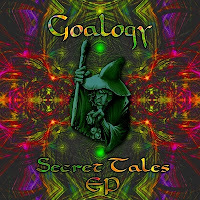 And to really get some good Goa sound, you'll need exactly what artists like Goalogy have. It can not be told, it's like magic. Born in 1988, Sergey Litvinsky rocks Moscow as a DJ. And he really did rock music and punk before 2004, when he started to make trance. In 2005 the Goalogy project was founded. To get into, you could listen into the Secret Tales EP.